Retail sales taxes are a transparent way to collect tax revenue. While graduated income tax rates and brackets are complex and confusing to many taxpayers, the sales tax is easier to understand: people can reach into their pocket and see the rate printed on a receipt. Less known, however, are the local sales taxes collected in 36 states. These rates can be substantial, so a state with a moderate state sales tax rate could actually have a very high combined state-local rate compared to other states. This report provides a population-weighted average of local sales taxes in each state in an attempt to give a sense of the statutory local rate for each state. 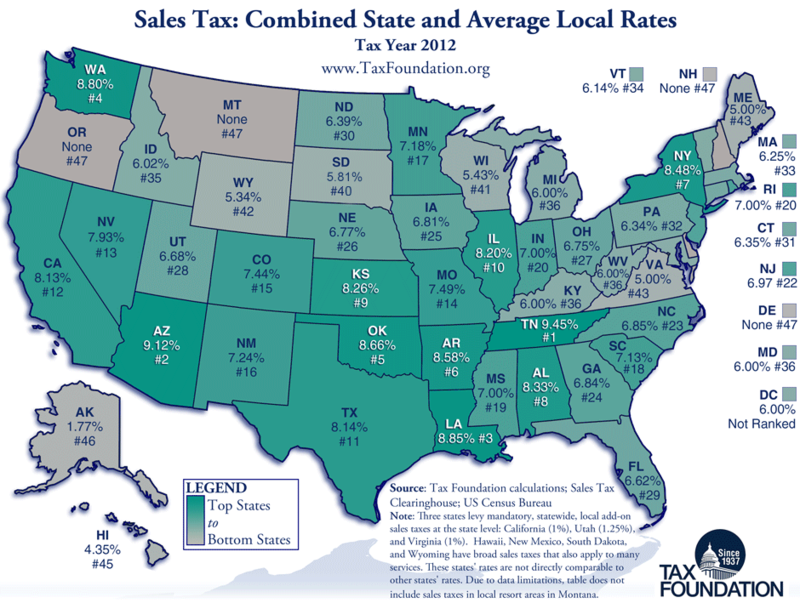 Five states do not have a statewide sales tax: Alaska, Delaware, Montana, New Hampshire and Oregon. Of these, Alaska and Montana allow localities to charge local sales taxes. In Alaska, high local rates in populous places like Juneau and Kodiak (5 and 6 percent, respectively) certainly increase the average local rate, but not enough to give Alaskans a higher combined rate than any state that charges a statewide rate. The five highest combined rates are Tennessee (9.45 percent), Arizona (9.12 percent), Louisiana (8.85 percent), Washington (8.80 percent), and Oklahoma (8.66 percent). Among the states with a statewide sales tax, the five with the lowest average combined rates are Hawaii (4.35 percent), Maine (5 percent), Virginia (5 percent), Wyoming (5.34 percent), and Wisconsin (5.43 percent). California, despite a 1 percent reduction in its sales tax rate that took effect July 1, 2011, still has the highest state-level rate at 7.25 percent. Five states tie for the second-highest statewide rate with 7 percent each: Indiana, Mississippi, New Jersey, Rhode Island, and Tennessee. The lowest non-zero statewide sales tax is in Colorado, with a rate of 2.9 percent. Seven states follow with 4 percent: Alabama, Georgia, Hawaii, Louisiana, New York, South Dakota and Wyoming. The five states with the highest average local sales tax rates are Louisiana (4.85 percent), Colorado (4.54 percent), New York (4.48 percent), Alabama (4.33 percent), and Oklahoma (4.16 percent). Mississippi has the lowest non-zero average local rate of 0.004 percent, attributable to the state's only local sales tax: a 0.25 percent sales tax in Tupelo, the birthplace of Elvis Presley, with a current population of 34,546. The highest city rate is 7 percent in Wrangell, Alaska, which–thanks to its small population (Census estimates 2,369 people)–does not have a substantive effect on the average local rate. 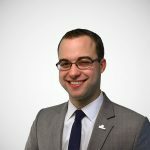 New Jersey has a unique system where certain shoreline and border jurisdictions are exempt from collecting the 7 percent state tax and instead collect a 3.5 percent local tax. We represent this anomaly as a negative 0.03 percent statewide average local rate, and the combined rate reflects this subtraction. Note: Some states levy gross receipts taxes in addition to sales taxes. (b) Three states levy mandatory, statewide, local add-on sales taxes at the state level: California (1%), Utah (1.25%), Virginia (1%), that we include in their state sales tax. (e) Some counties in New Jersey are not subject to statewide sales tax rates and collect a local rate of 3.5%. Their average local score is represented as a negative. Sales Tax Clearinghouse publishes quarterly sales tax data at the state, county and city level by zip code. These numbers are weighted according to Census 2010 population figures in an attempt to give a sense of prevalence of sales tax rates in a particular state. It is worth noting that population numbers are only published at the zip code level every 10 years by the Census Bureau, so the methodology in this version is slightly different than past versions of this calculation. It should also be noted that while the Census Bureau reports population data using a five-digit identifier that looks much like a zip code, this is actually what is called a "Zip Code Tabulation Area" (ZCTA), which attempts to create a geographical area associated with a given zip code. This is done because a surprisingly large number of zip codes do not actually have any residents. For example, the National Press Building in Washington, D.C., where the Tax Foundation is located, has its own zip code solely for postal reasons. For our purposes, zip codes that do not have a corresponding ZCTA population figure are omitted from calculations. These omissions result in some amount of inexactitude, but on the whole should not have a palpable effect on resultant averages, because proximate zip code areas which do have a ZCTA population number assigned to them capture the tax rate of whatever jurisdiction the area is located in. Erratum: This report initially listed South Dakota's average local rate as 1.34 percent, when it is in fact 1.81 percent (making a combined rate of 5.81 percent). The table above reflects this correction. Vertex Inc. 2011 Sales Tax Rate Report. http://www.vertexinc.com/PressRoom/PDF/2012/vertex-end-of-year-sales-tax-rate-report-11.pdf. 30 January 2012. This number includes a mandatory 1 percent add-on tax which is collected by the state but distributed to local governments. Because of this, some sources will describe California's sales tax as 6.25 percent. A similar situation exists in Utah and Virginia. The sales taxes in Hawaii and South Dakota have bases that include many services, and as such are not strictly comparable to other sales taxes. U.S. Census Bureau; Census 2010, http://factfinder.census.gov.